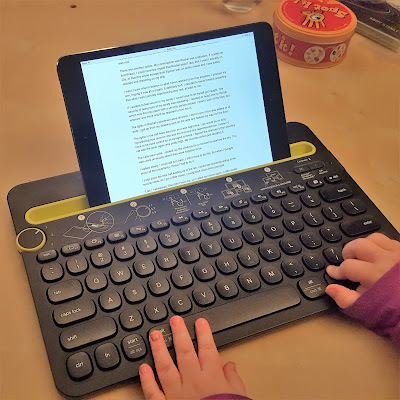 Beth Martin Books: Bluetooth Keyboard: Worth it for Serious Writers? Bluetooth Keyboard: Worth it for Serious Writers? Something happened to my laptop this week. I made a YouTube video about it. Basically, the computer I use for... everything... is out of commission. We have one other computer in our household: a desktop which is hooked into an enormous TV in the media room. I mean, it's nice doing photoshop on a 4K TV, but for most of the things I do, a little laptop will suffice. But without even a laptop, what is a writer to do? I spend a lot of time on my phone to stay connected with social media, but a phone can only do so much. I remembered I have an iPad somewhere, and those are basically mini computers, right? There were a couple of people who I met attending NaNo write-ins who used tablets for their writing. One was a 13-year-old girl. Naturally, thumb typing was her specialty (oh to be young and so adaptable again). The other, her mother, quickly pointed out the shortcoming of typing on a screen. Her main complaint: the abbreviated keyboard layout made some of the symbol keys change spots to less intuitive places. Still, I wanted to give writing on my iPad a fair chance. I decided the best route would be to get a Bluetooth keyboard and see how well that worked. My plan was then to review said keyboard on my blog... And here we are. I make most of my purchases on the Internet. I found a lot of affordable keyboards for sale but ultimately decided to buy one made by a brand I trust. So $20 later, I'm the proud owner of a refurbished Logitec Bluetooth keyboard. And it's amazing. I was totally ready to reveal how much I hated writing on tablets. They're not nearly as powerful as laptops. The keyboards you can get for them are too small to be unusable. Now, the keyboard I got (the k480) is a little heavy and certainly thicker than my MacBook Air, but it's still easy to take all over the house and it has a nice little groove which will hold up any size tablet/smartphone. I decided the best way to test my new toy was to work on my book using it. I've been able to do some writing on our desktop, but not as much as I'd like. I haven't purchased Scrivener for iOS yet, so I installed Google Docs on my iPad and wrote a quick 2k words on my manuscript ( I jest, it took me a few hours to type it all out). I can't yet comment on things like battery life, but I was impressed by the ease of use and accuracy of my new little keyboard. I'm still going to bring my laptop into the Genius Bar this week to see if it can be salvaged, but it's nice to know that I can feasibly get work done with a tablet and keyboard. Have you ever used something other than a computer to write? Let me know! A note about the photo: Those are my 2-year-old daughter's hands. The keyboard is not huge. Also, the text on the screen is part of the first draft of a new novel, so it's rough, to say the least.